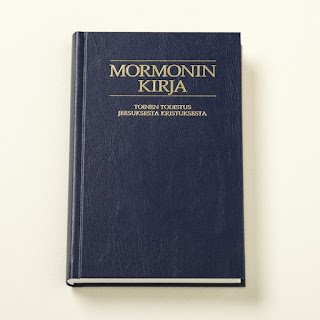 On a recent social media post, I shared some verses from the Book of Mormon that struck me in Finnish more than they ever had in English. I promised to explain, so this is a bit of that. I think one of many reasons that the Finnish speaks to me in scripture is that while the text is, for the most part, more formal Finnish than you’d hear in casual conversation, it is still modern Finnish. Written Finnish is relatively new, historically speaking, while the English of the Book of Mormon is more like the King James Bible, which was published some 400 years ago, so the language and sentence structure is more in line with what you’d find in a Shakespeare play. Add to that the fact of words’ meanings changing even in the last 200 years, and you’ve got a situation where the English won’t necessarily be as clear or powerful to the 21st century reader. Finnish as a language tends to be direct and to the point. Some would call it blunt. Combine that clarity with modern language, and for me, that equates greater understanding. 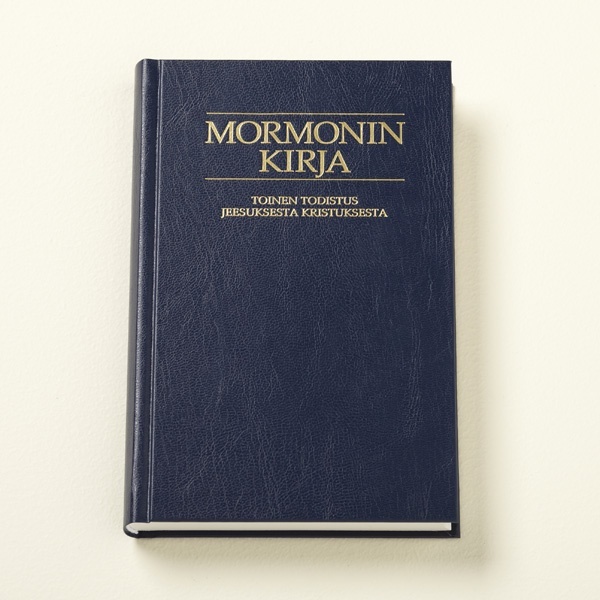 One small example: When I first began reading the Book of Mormon in Finnish, I was surprised at how often a verse began with the word “katso” (“look”). Then I glanced at the English and realized that “behold” was in the English at those same spots. And yes, “behold” does means “look,” but I’d never thought of it as an instruction. I’d seen the old-fashioned English word so many times that it had become almost invisible, a transition word that really didn’t mean anything. A caveat: I am not an expert in Finnish. While I attended public school in Helsinki for three years and became pretty fluent, that was over 30 years ago, and only in the last year or so have I really be studying to reclaim the language. The translations and notes below are my personal understanding. A native, or anyone with a better handle on the language, might disagree with my interpretations. The passage I quoted in the social media post is near the end of the Book of Mormon, written by Mormon’s son, Moroni. Some of the wording mirrors what Paul taught in 1 Corinthians 13:4–10. We’ll be looking at the English and Finnish of Moroni Chapter 7, verses 44–48. The Finnish feels like we’re talking about being physically in front of God, facing him on His throne—again, it feels personal. Literally, it’s almost “in God’s front.” It implies a close physical proximity. The English certainly can mean the same thing, but the same English phrase could also refer to God’s view or opinion about someone. To me, this section says that only those who are capable of withstanding God’s glory will be able to stand in front of Him. If we aren’t found “favorable,” we won’t be there. The Finnish flips the phrasing, putting the heart (sydän) first instead of last and conjugating the word as roughly “into the heart,” specifically referring to a singular third person (he/she). Finnish has one third person pronoun, “hän,” and all singular third person endings are the same, so this could refer to any individual. That gender-neutral pronoun, “hän,” is similar to “one” in English, except that it’s used in everyday conversation, which, of course, “one” isn’t. The verse so far says to me that those who can stand before God are those who bring into their hearts the qualities of being mild, meek, and humble. No matter how often you remember that “man” in scripture refers to all human beings, it’s a nice reminder when it's translated as “a person” (“ihminen”). Then we return to the third person singular individual: if a person has the qualities of mildness, meekness, and humility in their heart . . . I suppose, “confess” can mean those things in English, too, but I hadn’t thought of the word in those terms. To me, “confess” has some baggage in English, making that statement feel forced or somehow shameful on the part of the person saying it. “Tunnustaa” is also related to “tuntua,” which means “feel.” So individuals will not only be acknowledging Jesus, but they will also feel that He is their Christ. Another element here is how English does a weird thing with the word “of.” So often, we lose the concept of ownership and instead just have two things that are closely related. In this case, “the power of the Holy Ghost” puts Spirit at a distance for me, as if the power is something out in the universe somewhere in an unknown nebula or something. However, saying, as it does in Finnish, “the Holy Ghost’s power” suddenly makes me picture something new and different, something more, well, powerful. Many languages use the regular possessive in situations like this (for example, The Book of Mormon is translated as Mormon’s Book). In cases like this, I prefer that construction. Let’s combine the two concepts (first, acknowledging Christ and second, doing so with Holy Ghost’s power): In Finnish, I get the sense that acknowledging Christ is something that takes strength. Perhaps this means actually seeing Him, being in His presence, as we acknowledge that he is our personal Savior. In that case, it would make sense that we’d need heavenly power, that from the Holy Ghost, to withstand Christ’s glory to make such an acknowledgment. he must needs have charity; for if he have not charity he is nothing; wherefore he must needs have charity. hänellä täytyy olla rakkautta, sillä ellei hänellä ole rakkautta, hän ei ole mitään; niinpä hänellä täytyy olla rakkautta. The archaic English gets in the way here. Sure, we know that “he must needs have” means “he must have,” but having it stated so clearly in Finnish is a good reminder. Also, remember that it’s not “he” in Finnish. It’s “hän” which can refer to any individual. We must all have charity. The word “charity” in English, as we saw with “confess,” carries baggage that I don’t think was intended. In Finnish, it’s translated simply as “love.” It’s the same word you’d use when talking about a parent or child or your best friend, so it means a lot more than doing a big service project for people in another country. It’s caring for those directly in your sphere and loving them all in word and deed. And that fits for Latter-day Saints, because we believe that charity is the pure love of Christ—a definition that comes from this passage in a bit. To me, swapping “charity” out and adding “love” helps emphasize that meaning. Also note that each time something is listed as a characteristic that charity/love is not, the Finnish adds another emphasizing syllable. “Not” could be just “ei” here, but it’s “eikä,” making it roughly “also not” and with a “really, it’s not” sense. I’m going to break this verse down phrase by phrase, with the English on top, the Finnish beneath, and my translation of the Finnish in parentheses after that, along with any other notes or thoughts. This is another verse where the archaic English stands in the way of an otherwise clear meaning. The imagery of actively searching something out comes across clearer to me in the Finnish. The word “kestää” doesn’t have a simple English translation. It definitely means “endure,” but it means much more than that. When you “kestää,” you are holding on. You have strength. Inanimate things can “kestää” (or not), too. If you’re walking over icy snow, and then suddenly it breaks and your boot goes through, the snow didn’t “kestää” under your weight. So “kestää” implies a strength and resilience that “endure” doesn’t. “Kärsii” implies pain, so while it does mean “endure,” it’s a different kind of endurance than the kind implied by “bearing” all things. sillä rakkaus ei koskaan katoa. Love from God will never leave you alone. It will never disappear. How cool is this one? This is the one time that the English “charity” isn’t translated directly as “love.” I imagine that’s because the next needs to be more specific; it’s distinguishing types of love. And real, genuine, authentic love is Christ’s love. Christ’s love is clean and pure and innocent. Remember what I said about “kestää”? We see it again here, and it means so much more than enduring with gritted teeth. Note that the -kaa added to the first word (“rukoila,” meaning “pray”) is another intensifier, making it an important instruction. Again with the possessive “of.” For me, if a sentence is put into regular possessive, it’s more powerful. I can become one of God’s children. Wow. Also note that the Finnish says we may become God’s children. Not just sons. WOW AGAIN. We can be like Him when He appears! The Finnish “ilmestyessään” is more active, and can also mean “when he is revealed” Much more powerful for me. than merely appearing. Hard to explain why the Finnish affects me so much on this one, but it does; the idea that we’ll be able to see God as He actually is amazing—and it’s a reminder that our tiny mortal brains have no clue what God is really like. That whatever mortal blinders we’ve lived with will be removed, and we’ll be able to see eternity and God as they really are. että meidät puhdistettaisiin niin kuin hän on puhdas. Now for something rather vulnerable. (As if discussing my faith weren't already!) For anyone wanting to see the whole thing altogether, hear it, and/or follow along: Below is the full Finnish text of this passage as well as a recording of me reading the passage in Finnish. 44 Muuten hänen uskonsa ja toivonsa on turhaa, sillä kukaan ei ole otollinen Jumalan edessä, paitsi sydämeltään sävyisät ja nöyrät; ja jos ihminen on sydämeltään sävyisä ja nöyrä ja tunnustaa Pyhän Hengen voimasta, että Jeesus on Kristus, hänellä täytyy olla rakkautta, sillä ellei hänellä ole rakkautta, hän ei ole mitään; niinpä hänellä täytyy olla rakkautta. 45 Ja rakkaus on pitkämielinen ja lempeä eikä kadehdi eikä pöyhkeile, ei etsi omaansa, ei vihastu helposti, ei ajattele pahaa eikä iloitse vääryydestä vaan iloitsee totuudesta, kaiken se kestää, kaiken se uskoo, kaiken se toivoo, kaiken se kärsii. 47 mutta aito rakkaus on Kristuksen puhdasta rakkautta, ja se kestää ikuisesti; ja kenellä sitä havaitaan olevan viimeisenä päivänä, hänen käy hyvin. 48 Rukoilkaa siis, rakkaat veljeni, Isää koko sydämen voimalla, että täyttyisitte tällä rakkaudella, jonka hän on suonut kaikille Poikansa Jeesuksen Kristuksen tosi seuraajille; että teistä tulisi Jumalan lapsia; että me hänen ilmestyessään olisimme hänen kaltaisiaan, sillä me saamme nähdä hänet sellaisena kuin hän on; että meillä olisi tämä toivo; että meidät puhdistettaisiin niin kuin hän on puhdas. Aamen.